Writing a basic essay shouldn’t be a difficult task, but many students find it to be problematic, particularly if they have no idea of how to organize their thoughts on the subject they have chosen to write about or of how to put those ideas down on paper in a cohesive, coherent manner. Most students don’t realize there are basic steps that can be taken to write an effective essay. Understanding the basic elements of an essay, the types of rhetorical modes, and the process of drafting the essay step by step, students will be better prepared to tackle the task of writing a basic essay. Following the steps outlined in this book is essential to creating an essay that is not only organized and engaging, but also provocative and well written. About the Author–Katrina Parker Williams teaches English grammar and composition at a community college. She is the author of the following titles available at Amazon. 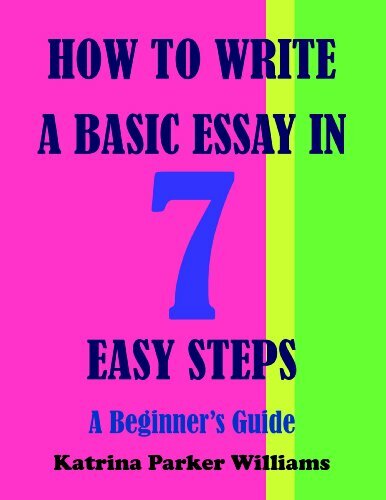 This is the Kindle version of How to Write a Basic Essay in Seven Easy Steps: A Beginner’s Guide — Also Read How to Write a Great Short Story — How to Write an Argumentative Essay — How to Write a Researched Essay that you can also download and read on your computer and mobile phone. Kindle books are DRM protected and therefore, unlike ebooks that are in PDF or ePUB format, you cannot read this ebook without the official Kindle apps.